Kerstin Demko, the director of Sage North America’s Partner Marketing, announced the self-proclaimed worst kept secret last Thursday: Sage Summit 2019 will take place this year. And once again, Sage has listened to its customers and partners. Even more interesting: Sage received some feedback on the changes even before it was announced. But I’ll get to this spoiler alert in a bit. For now, lets get into the details, from the Main Event(s) to the Sage Sessions, and what to know about where to go. If you were here, it wouldn’t matter which coast Sage Summit 2019 was on. Sage Summit, and really any major conference in the United States, tends to have a problem with location. Unless you host your conference in Lebanon, Kansas, some partners and customers will have the burden of travelling more than others. For Sage Summit 2019, Sage is trying to alleviate that issue by hosting the event twice. Sage Summit West will take place in San Diego from Feb. 13-15 and Sage Summit East will take place in Atlanta from May 13-15. This is an interesting strategy, and I hope it works. Many of our customers said it was hard for them to travel when Sage Summit was on the east or west coast, especially going from west to east. With the time zones involved, our customers from the west coast said it was a burden because it took an extra day’s worth of travel — especially for a day-and-a-half event like Sage Sessions. From what we understand, both Sage Summit East and Sage Summit West will be duplicates, so no customers will have to attend both. There will also be a full trade show at both events, which was a major sticking point for customers. However, a major change to Sage Summit 2019 is that the content will be focused on Sage 100 and Sage 300 products. There will be a separate events for Sage enterprise-level products and Sage Construction and Real Estate products. Sage CRE and Sage enterprise customers will have separate, smaller events but focused on their needs. This is a welcome change, as these two segments were under-served for the past few years at Sage events. 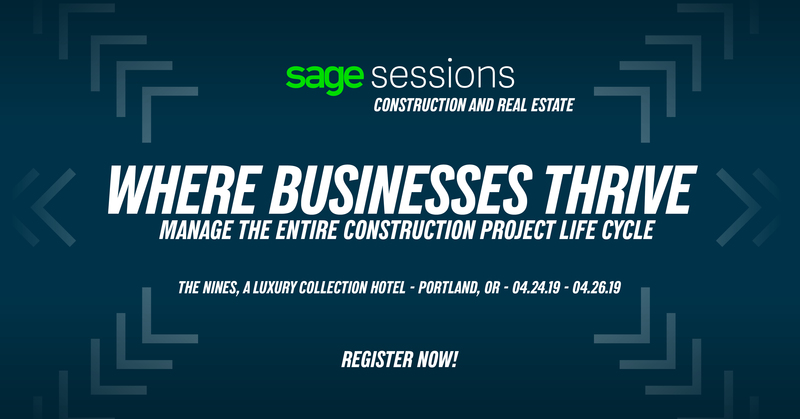 Sage Sessions: Construction and Real Estate is scheduled for April 24-26 in Sage CRE’s hometown of Portland, Ore. The event will start with a welcome reception and continue with keynotes, breakout sessions, roundtable discussions and a product showcase. Sage Summit 2019, and other Sage events during the year, will be more focused for customers. I’ve always thought Sage needed an event for its Sage CRE folks. The TUG National Users Conference, is a brilliant conference for all Sage CRE product users — but it’s really expensive. It’s absolutely worth it in what attendees receive — especially with the training sessions available — but many small businesses can’t afford to send their employees away for a week to do training. Having a Sage Session for Sage CRE is a great compromise. This way, Sage CRE folks won’t feel obligated to make it to two major events in a year. Also, customers who can’t afford to go to the TUG conference will now have an option. The Sage Sessions for enterprise-level customers will take place later in 2019. We know this event is happening, but we’re hearing some conflicting information about the details. The one thing we do know is the event will focus on Sage Enterprise Management. During the recent Sage Business Partner Advisory Council meeting, it was mentioned that Sage 500 would be included in this event. We also had the privilege of hosting some Sage executives last week at the Practical Software Solutions office, and they said this wasn’t set in stone. However, they were able to get some instant feedback: We had mentioned to our customers during Tuesdays with Practical that day, and our Sage 500 customers were ecstatic about having an event with the Sage Enterprise Management folks. We mentioned our Sage 500 customers not only enjoy content for their product, but also they’re generally interested in following the progress of Sage Enterprise Management. The good news, as I’ve said many times in the past, is the folks from Sage who were in the room with us were really receptive to this instant feedback. We’re hoping this is the case because this would be the best scenario for our customers, and that’s really what counts. We’re expecting to hear more soon, and registration for the scheduled events will be announced this week. It’s great to see Sage once again listening to feedback and trying to do the best for all its customers and partners.